Food is part of the traveling experience and there is a lot that can be said on this topic, and a lot to taste too! 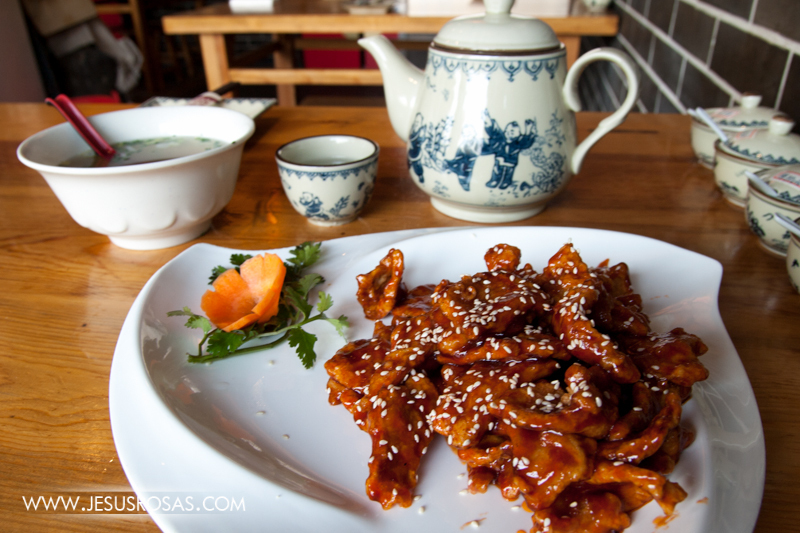 In this post I’m sharing a couple of pictures of my favorite Chinese dish: Táng Cù Lǐ Jǐ (糖醋里脊), which can be translated as sweet and sour pork loin. The name may vary depending on the place. 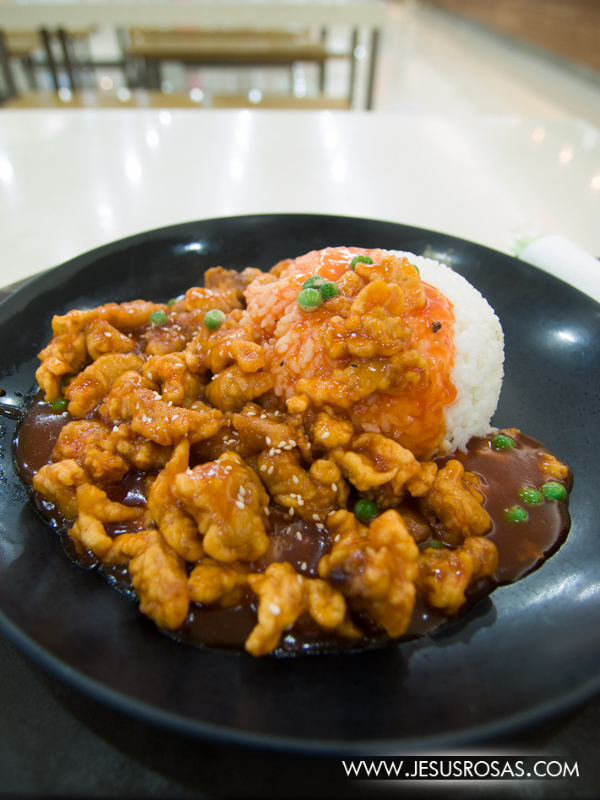 The ingredients may vary slightly, but usually you will find that it is fried pork strips coated with cornstarch and egg and covered in a sweet and sour sauce. The most common ingredients in the sauce I know of are vinegar (white, rice, balsamic), sugar, tomato paste or ketchup and salt. Some variations may include chicken bouillon, ginger, garlic, parsley, black or white pepper, and more. I have also seen the dish with pineapple, green peppers, peas, and/or other ingredients. A very popular way to eat it is with rice, and for me I hardly get it without it. One of my favorite ways to eat it is when the outside is slightly crunchy, the meat soft and tender, and a thick not too sweet nor to sour sauce. Many foreigners in China like this dish too. I know people can get it in many places in China, big and small cities in different provinces. I have eaten this in Beijing, Chengde, Dalian and in all cities in Shandong Province such as Jinan, Qingdao, Weifang and Changle. You can find it in small and big restaurants, including restaurants at several hotels, and food courts at different malls. Price is usually between 22 CNY and 38 CNY (43 MXN y 75 MXN or 3.5 USD y 6.1 USD) (1). 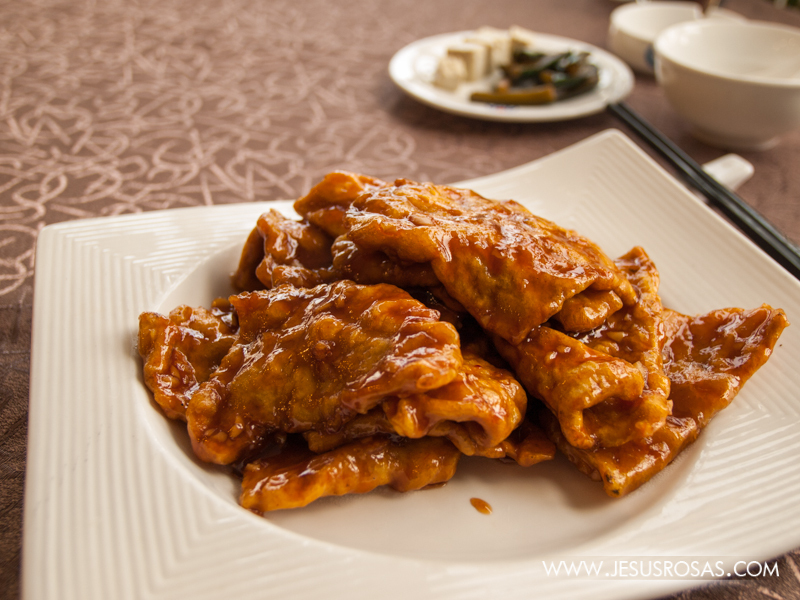 Sweet and sour pork at the restaurant of Oceanwide Hotel on Heping St. near Dongfeng St. in Weifang, Shandong, China. Price: 32 CNY (March 2013). A beef version of the dish with peas at MyKal mall in Qingdao, Shandong, China (July 2012). 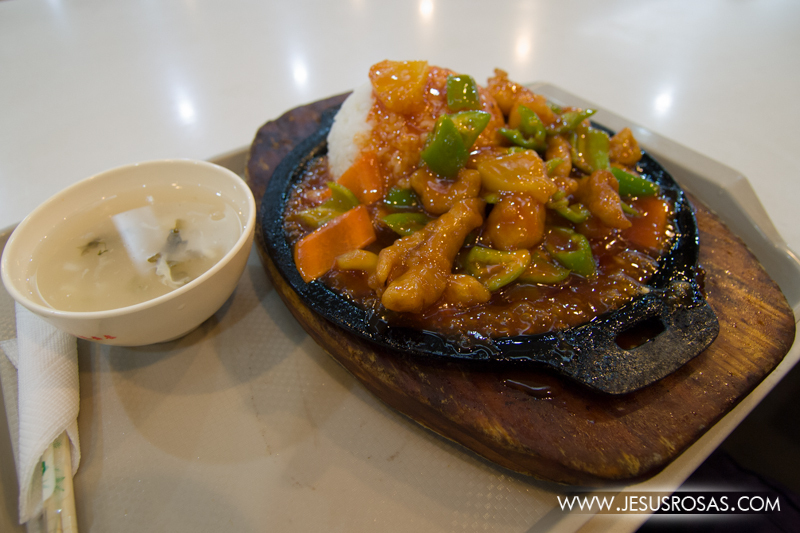 Sweet and sour pork with pineapple and green peppers at MyKal mall in Qingdao, Shandong, China. I like pineapple, but the coating had a funny taste, maybe old and rancid. Price: 22 CNY (July 2012). A dish at the Weifang Impression hotel (潍坊印象酒店) restaurant on Shengli and near Jinma, Weifang, Shandong, China. This is one of my favorite restaurants in Weifang. The food is good, the menu has enough options, the decoration depicts traditional Weifang style, and you get bouillon for free. Price: 38 CNY (March 2013). If you would like to receive an automated notification with new posts of this blog, enter your email address next to the title of this post at the right top. You will receive an email to confirm your subscription. If you don’t receive anything, look in your spam folder. If you liked this post, click on the “Like” button.